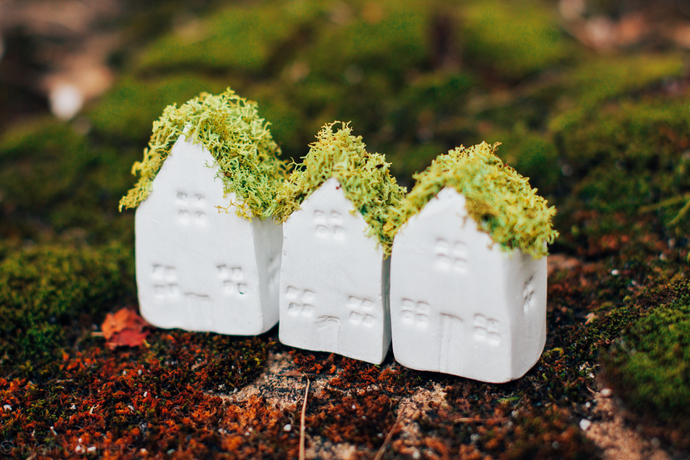 Miniature turf houses with mossy roofs! Perfect for your little terrariums, or to sit on a shelf. This is for one (1) white house with a moss roof. Each house is handmade, so no two are alike. Would you like the door painted a color? Feel free to let me know at checkout, and I will gladly paint it! Made of sculpey clay, and painted solid white with acrylic paint. The moss roof is reindeer moss in chartreuse. Two coats of matte varnish to seal paint and moss so loss is minimal.